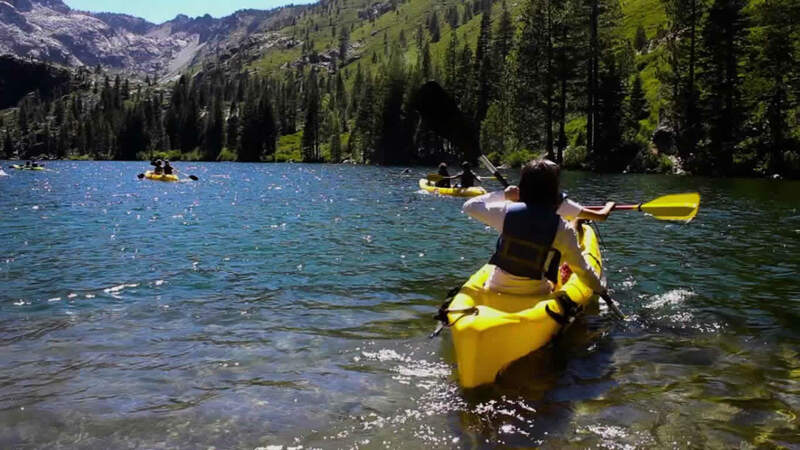 You'll be able to go kayaking on lakes in the Lakes Basin Recreation Area, just 10 minutes away, including Lower Sardine Lake and Salmon Lake. During our sessions of two-weeks or longer, we may mix up our destinations, which could also include Stampede Reservoir, and Donner Lake. Lower Sardine Lake is very scenic, with the majestic Sierra Buttes providing a beautiful backdrop for your kayak trip across the lake. You'll paddle about 3/4 of a mile (1 kilometer) across the lake and beach at the inlet stream. You'll then hike up the stream a short way until you reach a hidden 40 foot (13 meter) waterfall. There's always someone who can't resist wading under the falls for a natural scrub! Salmon Lake is another gem. It has its own island to paddle around and explore, and has some great rocks from which you can jump into the water. Stampede Reservoir is bigger than either Sardine or Salmon lakes. It has a beautiful a varied coast line and a couple islands. It has a camp ground from which we occasionally run an overnight trip where we'll kayaking and paddle board. Donner Lake is the largest of the lakes and provides room to roam. There are also lots of inlets and other areas for you to explore in a kayak. This lake is farther away from camp and as a result not visited much.